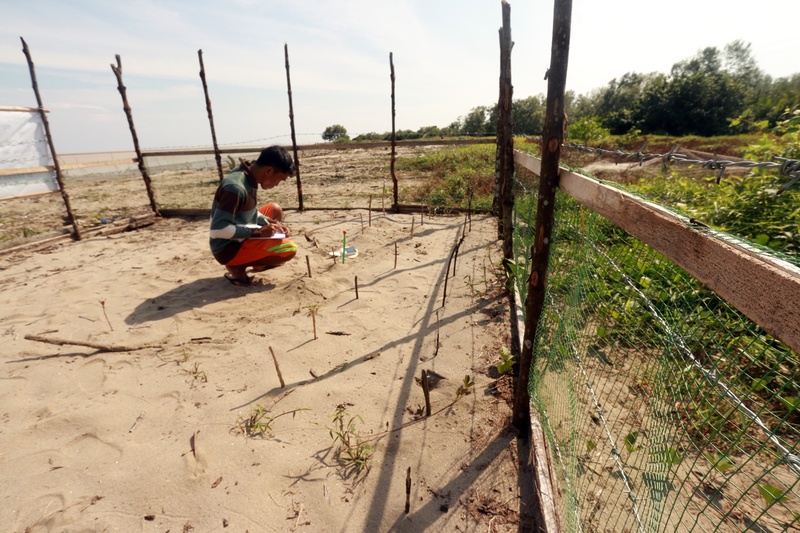 Totally, 407 eggs of 25 nests have been secured and currently incubated at in situ hatchery, located on nesting beach, in Aceh Tamiang, Aceh, Indonesia. 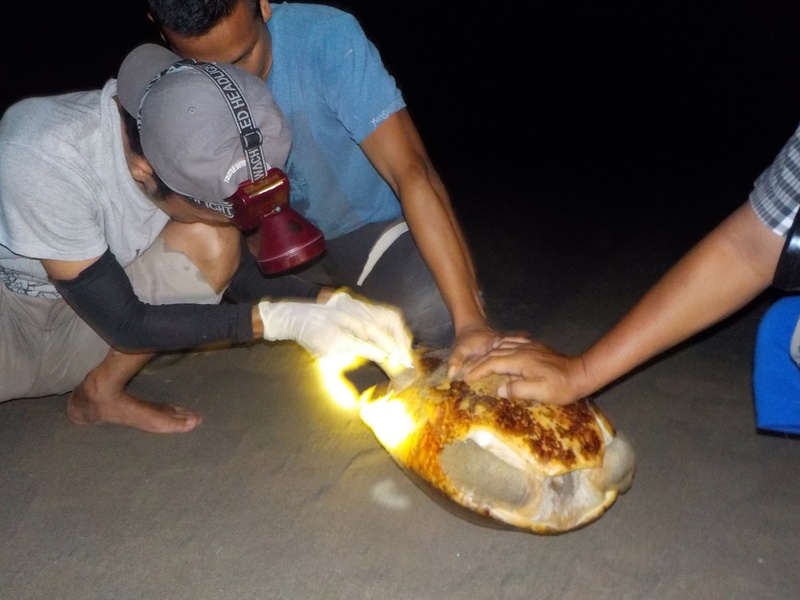 Since December 2016, the team of Satucita Foundation and BKSDA (Agency of Natural Resources Conservation) Province Aceh have been patrolling on the beach to secure the eggs from harvesting by some villagers and wild boar. Although some villagers are still trying to harvest the eggs in nesting season, the cases are declining. But, the threat from wild boar (Sus scrofa) is still same. As of today, eggs of 4 nests had been eaten by wild boar before found and secured by our team. When the nesting beach has about 3 km in distance, it seems impossible to fence along the beach to secure the eggs from wild boar disturbance. Therefore, the nest patrol must be conducted annually. The eggs had been secured, currently are incubated at in situ hatchery that built on the nesting beach. The hatchery is fenced by barbed wire to prevent it from wild boar disturbance. On hatchery, the nest temperature, sand moisture, air and humidity temperature were recorded four times every day. We are estimating the eggs will be started to hatch in late of March. Our team were usually patrolling along the beach, about 6 km in distance, every night. In particular days, the patrol was conducted two times per night when the high tides occurred at about 4 to 5 am. 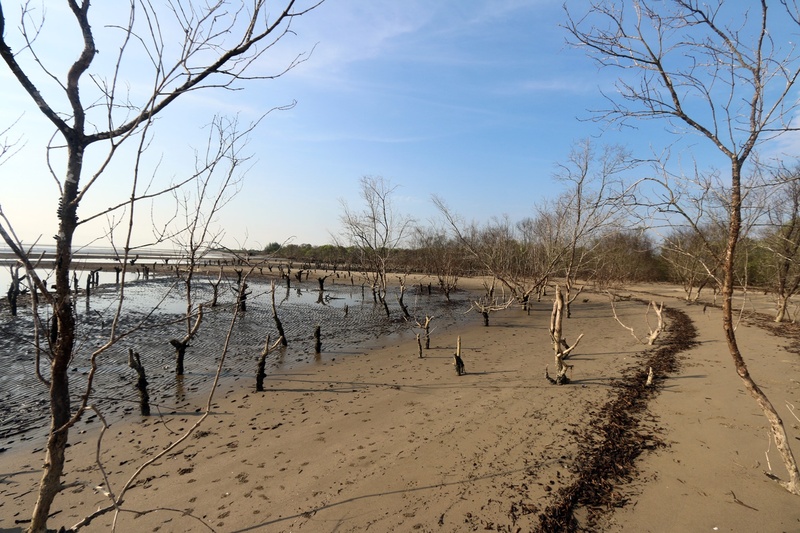 During these days, the low tide was still occurred at 7 to 8 pm. In this time, the emerging of Painted Terrapin female for nesting on the beach was still possible. The movement of female for nesting is determined by tidal. Nest characteristics – depth, width, sand moisture and temperature, air temperature and humidity – are also measured. The female found was also injected with Pit Tags for future monitoring. 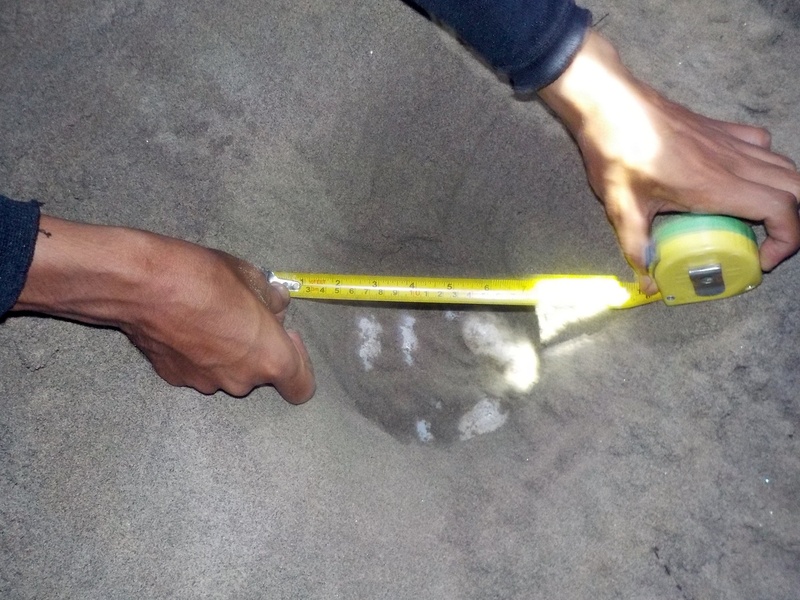 Every nest found on the beach was moved and reburied on the hatchery that situated about 30 meter of our nest patrol camp. The new nest has a same depth and width with the original nest. It is to ensure that there is no temperature and moisture difference between original and new nest. The total number of eggs secured this year is decreased compared to last year. Total number secured last year was 910 eggs of 52 nests. The declining is about 55 percent compared to last year. That declining is very affected by some factors. First is coastal erosion. It is estimated that about fifty percent of beach that usually become a nesting site for Painted Terrapin has lost due to erosion. This is the first time since the annual nest patrol has been conducted in 2010. This massive erosion is caused by southeaster that makes heavy waves to hit the beach, so the sandy beach was moving or lost. Second is caused by shrimp trap. 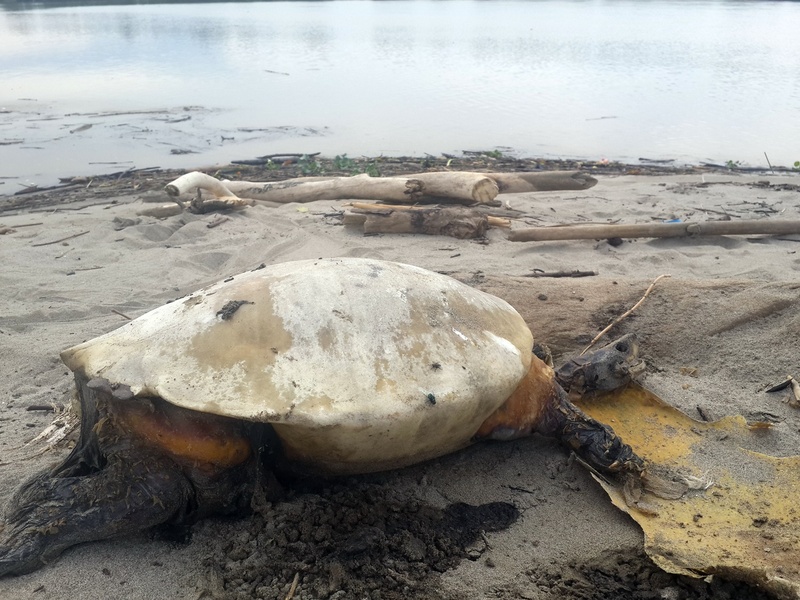 Reports from fishermen said that some adults of Painted Terrapin, male or female, found dead because trapped in shrimp trap that used by fishermen. Fishermen are using banana or coconut as bait to capture shrimp. These baits are feed for Painted Terrapin. The trap is installed on river floor and checked by fishermen after few hours. The trouble is occurred when Painted Terrapin eating that bait and trapped, so she/he is not able to swim to the surface to breathe. Therefore, it has made the number of adult female laying nest on the beach is declining. The third is massive amount of trash on the beach. The trash is dominated by logs, twigs. These made the adult female facing hard obstacle and difficulties to find the suitable place for digging nest and laying eggs. Even, some females were sighted to return to the sea immediately, after she could not find the place for digging nest and laying eggs. If she could not find the suitable location for nesting, then the best possibility was she had to move to another beach for nesting. 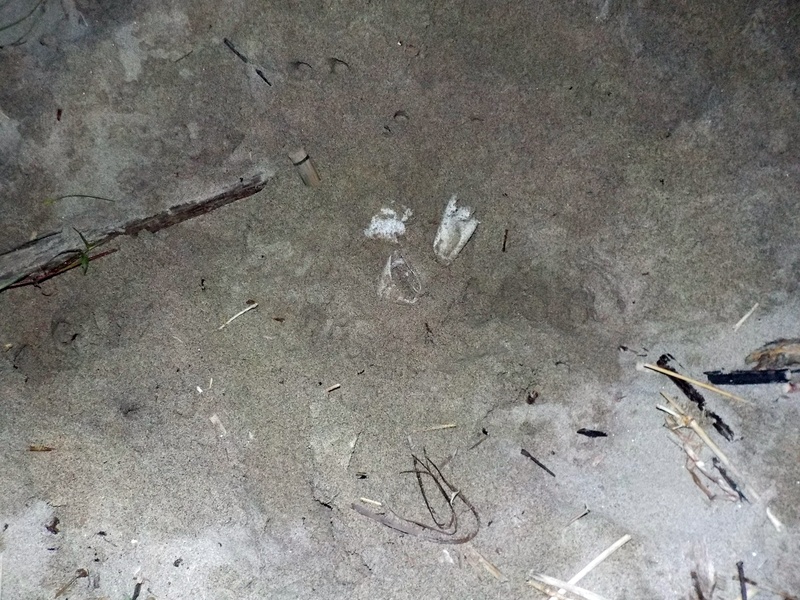 Some female’s footprint that had to return to the sea due to hampered by logs or twigs were found on the beach. 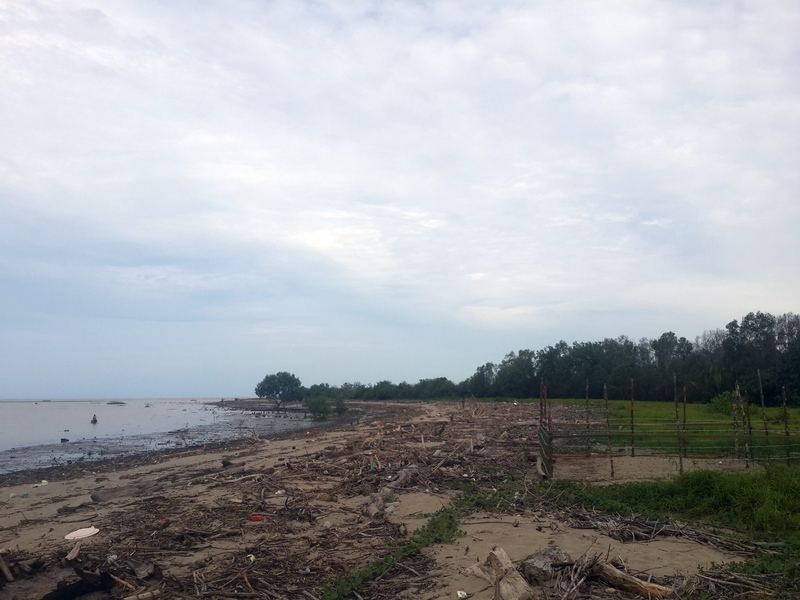 Unfortunately, our team would not be able to reach that beach because we had to crossing the estuary by boat.